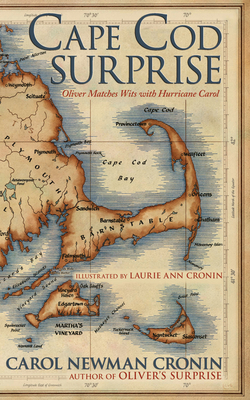 The character we came to love in Oliver's Surprise finds himself on Cape Cod aboard his grandfather's boat, the beloved "Surprise" as a major hurricane threatens to make landfall. In 1954, Hurricane Carol's wrath was felt from the Carolinas to Maine, and in Boston, she blew down the spire of the historic Old North Church. Her destruction was so complete that the name will never again be used; Carol was the first Atlantic hurricane name in history to be retired. Once again, young readers see New England coastal history through the eyes of our intrepid Oliver, now a seasoned time traveler. As Carol starts to bear down on the sandy coastline, Oliver must face his own fears and uncertainties while contending with a renegade aunt and another time traveler who refuses to let go of modern niceties. "Carol Newman Cronin has written an evocative story of a young man and the sea. You can smell the salt, hear the groan of the sails and feel the tiredness of oliver's muscles--and as he's travelling through time, surviving hurricanes, and discovering his love of this way of life, he's also discovering himself. A wonderful book." -Holly LeCraw, author of the "The Swimming Pool"